Palmusic UK celebrates Iyad Sughayer, Trinity Laban Gold Medal Award 2018. 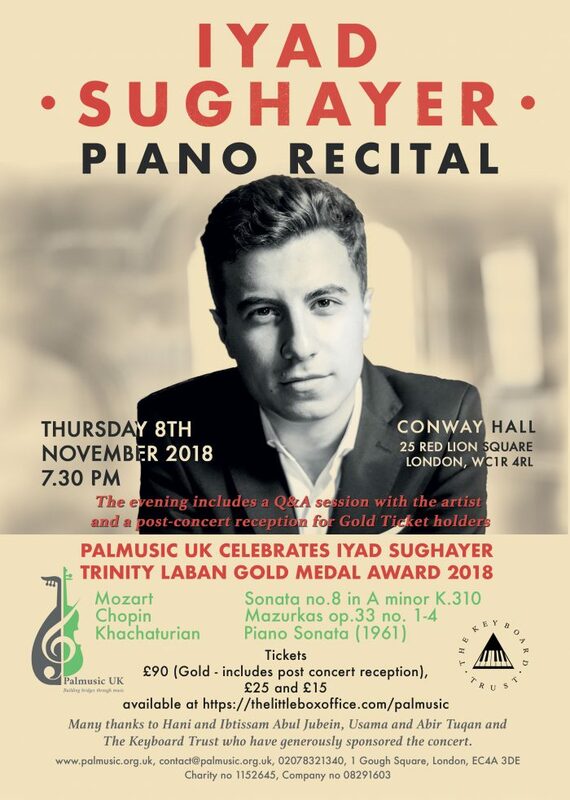 Palmusic UK are delighted to present Iyad Sughayer in a solo recital at the Conway Hall, November the 8th, 7.30 pm to celebrate the award of the prestigious Trinity Laban Gold Medal 2018. Join us and get enchanted by an inspiring programme which includes Mozart, Chopin and Khachaturian. Palmusic UK are proud to be hosting a solo recital to celebrate Iyad’s success of his early career. January 2018 marks Iyad’s Gold Medal Award, the prestigious award issued by the Trinity Laban Conservatoire of Music and Dance. Following a sell-out showcase of recitals at world-class cultural hub Kings Place, Iyad Sughayer was selected as this year’s competition winner. The Jordanian-Palestinian pianist gave stunning performances of the serene ‘Les Cloches de Genève’ from Liszt’s Années de Pélerinage, and the vivacious first movement from Khachaturian’s Piano Sonata. More recently, Iyad has collaborated with Palmusic UK and our beneficiaries Omar and Tibah Saad, and Lourdina Baboun in two tours held in February and June, in support of our UK Scholarship Fund. 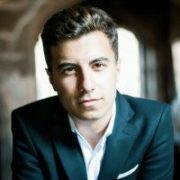 In February 2018, he has joined Wissam Boustany, Omar and Tibah Saad in the very successful concerts we presented in Salisbury and Brighton. More recently, he has performed with Wissam Boustany and Lourdina Baboun in two wonderful nights Abergavenny and Guildford. Doors will open at 7. The concert will start at 7.30. After the recital there will be a short interval of 10 mins, followed by a Q&A session open to all, where you can get to know Iyad more closely and ask him questions. At 9.15 pm Gold tickets holder are welcome at the Brockway Room (Conway Hall) for a reception with the artist. Your ticket will go in support of Palmusic UK projects. By buying your ticket, you are supporting many young people in Palestine who are not able to afford music education at the Edward Said National Conservatory of Music UK.